Beer Cheese Dip is a super easy and delicious dip to make for any occasion. Quick to make (only 15 minutes tops!) The perfect party food appetizer for dipping pretzels, carrots, broccoli, tortillas, bread and more! We love to watch the game while enjoying our favorite snacks like Totchos (Tater Tot Nachos), Baked Brie and Mozzarella Stuffed Meatballs. 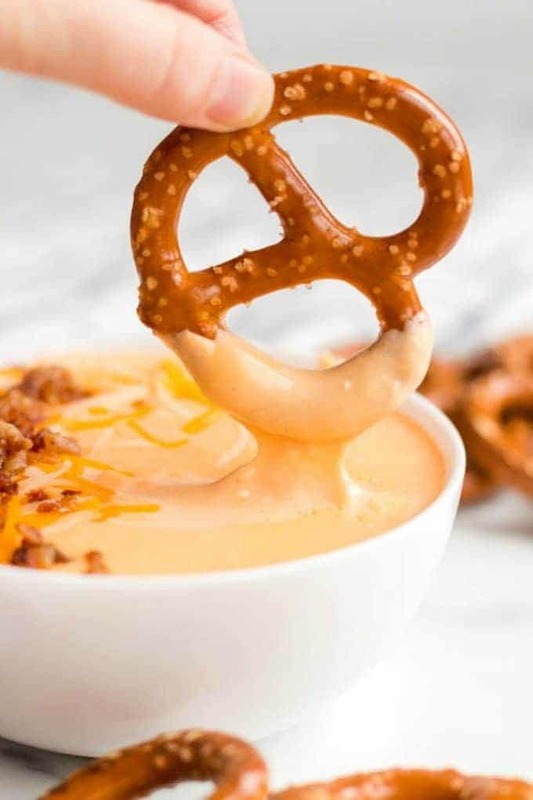 We are always looking for new party food ideas and this Beer Cheese Dip is one of our newest favorites. The other night we were out for dinner and ordered this amazing appetizer. It was pub style cheese dip! OMG, they served it with these delicious soft pretzel bites. My family gobbled them up in no time. So I thought that this would be the perfect game day recipe to serve at our Super Bowl party in a few weeks. For the past few years, we started doing our party with only appetizers and desserts. I mean seriously, who needs the main meal? All everyone really wants is the pre-dinner and post-dinner treats! Right? Appetizers are my favorite recipes to make and I have been on a total dip trip lately. Spinach Artichoke Dip – Popular! Nacho Cheese Dip – Easy Recipe! Place the cream cheese and beer to your pan. Over medium heat melt cream cheese together with beer. Whisk together until well combined. When cream cheese is completely melted, add garlic salt, paprika, extra sharp cheddar, and Monterey jack cheeses, stirring continuously until cheese is melted and all ingredients are combined. Transfer to a serving dish, garnish with additional shredded cheese bacon crumbles if desired. Serve with pretzels, veggies or bread for dipping. If you want to keep the dip warm throughout your party, you can transfer the dip to a small crockpot and keep it on low heat or even on the warm setting. Does Beer Cheese Dip Have Alcohol? 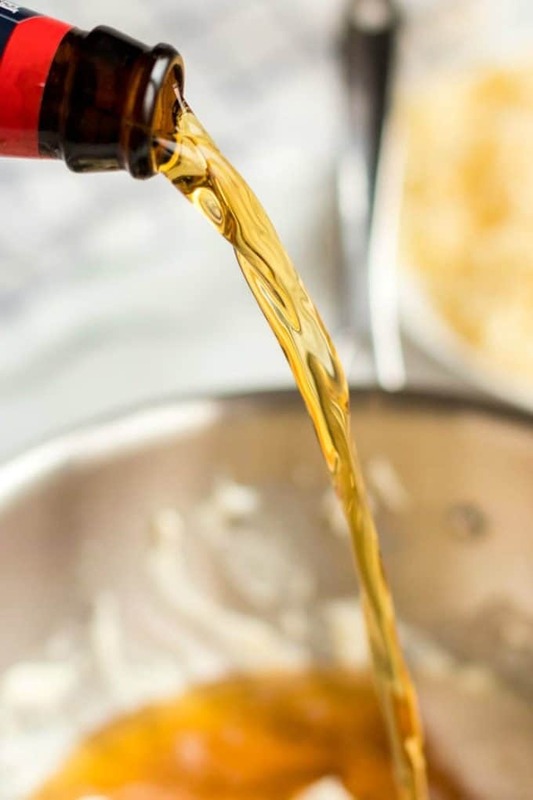 Technically you use beer in the beer cheese dip, however, the alcohol cooks out of the cheese dip and you cannot get intoxicated from eating beer cheese dip! In the off chance that not all of the alcohol cooks out, there is not enough alcohol to get you even the least bit drunk. 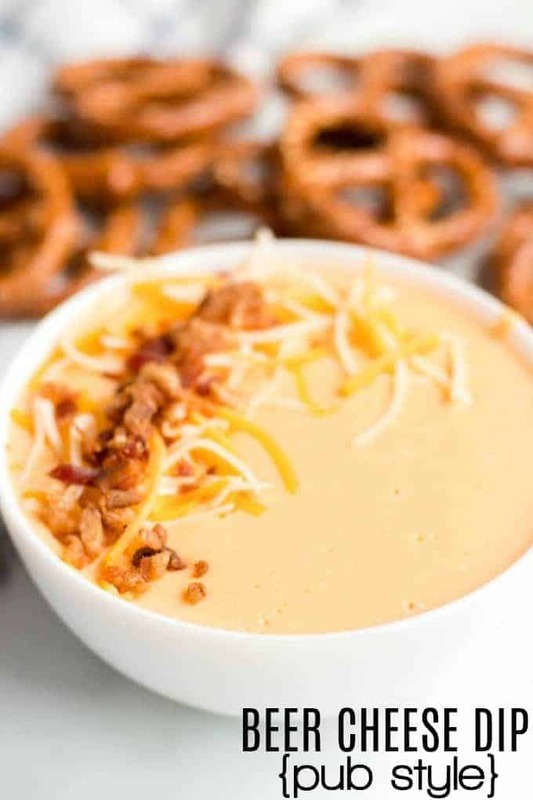 There are no limits to what you can serve with your beer cheese dip! We love everything from soft homemade pretzels, tortillas, carrots, cauliflower, celery, bread. The possibilities are seriously endless. 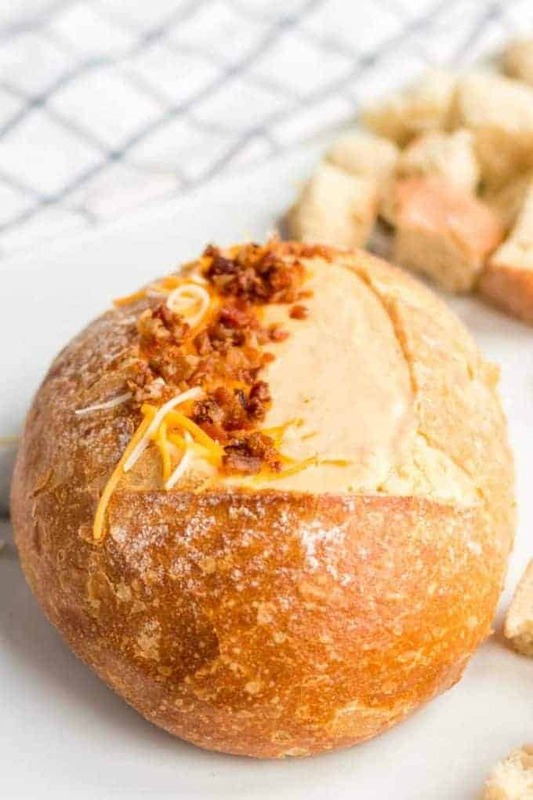 One of our favorite things to do with our cheese dip is to hollow out a bread and make a bread bowl! 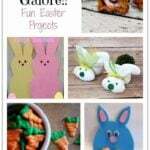 The presentation is amazing! Add cream cheese and beer to pan. Over medium heat melt cream cheese together with beer. Whisk together until well combined. Serve warm with pretzels, veggies or bread for dipping. 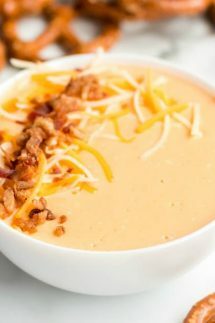 Beer cheese dip is one of my favorite party appetizers! I always forget about making it at home, though! 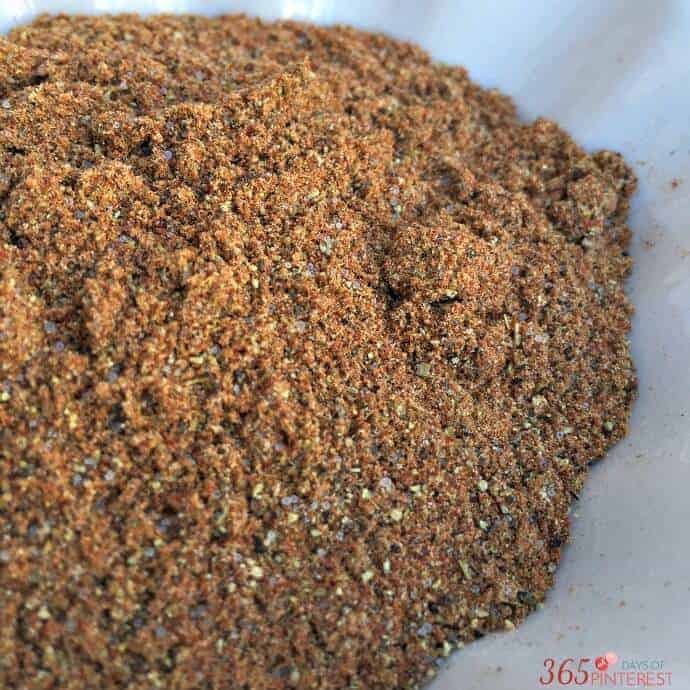 Thanks for this easy recipe – I can’t wait to try it! This is such a great dip – my family loves it with soft pretzels, so good! This dip has become a hit at all of our game night parties, everyone keeps asking for it! So glad you guys love it as much as we do! 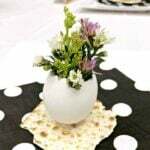 My husband really loves this!! Such an amazing dip! Mine come out runny. Written instructions shows to use 12oz of beer but video shows 8oz….maybe that’s why? Hey Jolene – I haven’t tried reheating it, but I would think it would be fine. Just chill it until you are ready to use and then heat it covered on medium in the microwave (stirring frequently) until the temp that you are looking for.